(transitive) When you make sure that someone/something is safe and well. To take care of someone (or something) by doing what is needed to keep them well or in good condition. You can look after another person OR yourself. My son went on vacation so I had to look after his dog. Looking after his dog means I have to feed it, give it water and make sure it stays healthy until my son arrives back. I probably have to take the dog for walks too. Could you look after the baby while I’m in the shower? You want the person to take care of the baby to make sure he or she doesn’t do anything crazy or dangerous… as babies have a tendency to do when you aren’t watching them. You’re pregnant, you should look after yourself more. Yes, you shouldn’t be going to parties until the sun comes up. You need to rest more so the baby will be healthy when he or she is born. You can tell that he has always looked after his car. It still runs well after all of these years. Yes, he doesn’t go racing in his car, he drives carefully, and makes sure everything is fine with the motor. 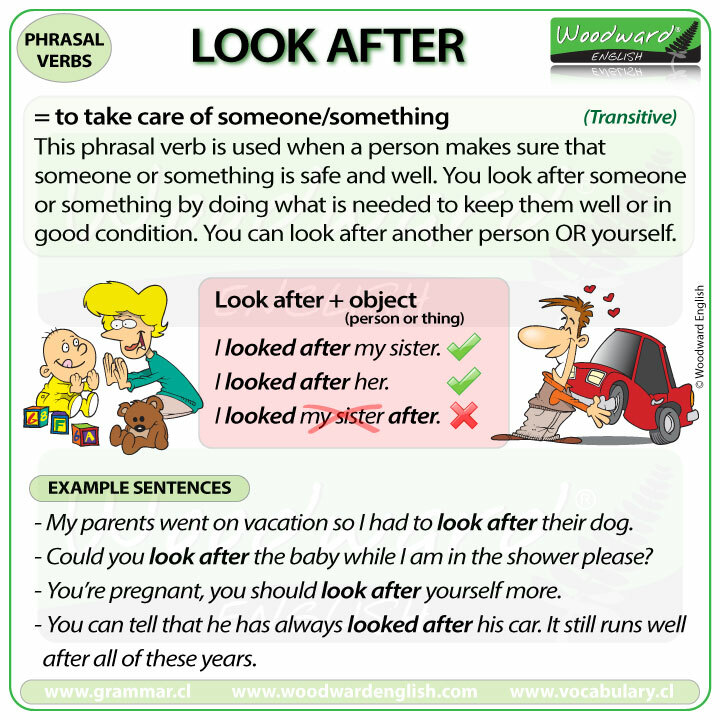 The phrasal verb Look after is transitive which means it needs an object after it. That object can be a person or a thing. You cannot just say I looked after…. Because we need more information. Looked after WHAT or WHOM? With this phrasal verb, we cannot put the object in the middle. I looked my sister after …. is NOT correct. We can also look after things. But we cannot say: He looked his car after. …no, this is not correct.